When it's blazing hot in the Reno area, lots of people head up the hill to enjoy the relative cool at Lake Tahoe. 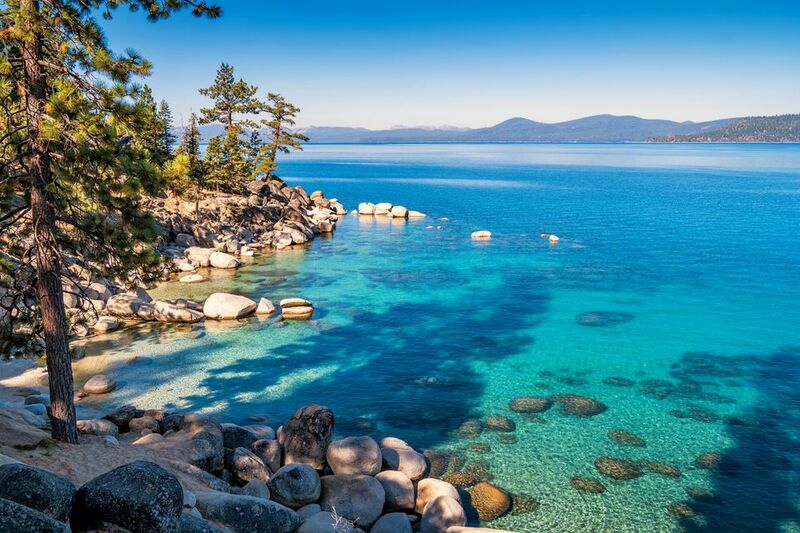 It's usually at least 10 degrees lower in temperature due to the higher elevation, not to mention the massive body of water that imparts its cooling effect throughout the Lake Tahoe Basin. A common characteristic of just about all Lake Tahoe beaches is limited parking. It can be a total hassle on busy summer weekends, so try to arrive early if you want to park within reasonable walking distance of your chosen beach. Sand Harbor is one of the most popular beach parks around Lake Tahoe and is just about the closest one to Reno. Sand Harbor is part of Lake Tahoe Nevada State Park and located 3 miles south of Incline Village on Nevada 28. The beautiful, sandy crescent beach is a magnet on hot summer weekends. If you don't get there early, you will not get a parking place and be turned away. Parking along the highway is illegal, and walk-in access to the park is not allowed; instead, park in Incline Village and ride the shuttle bus to Sand Harbor. The bus ride is cheap, and the fare includes entry to the park. Cave Rock is a recreation area that is part of Lake Tahoe Nevada State Park. Cave Rock has a sandy swimming and sunbathing beach that's nice for kids and families. There is parking, picnic areas, restroom, and boat launching. Like other Lake Tahoe beaches, the parking area fills up quickly on nice summer weekends. Cave Rock is next to U.S. 50, 3 miles south of Glenbrook. The entrance to the park is just south of the twin tunnels through Cave Rock itself — it's hard to miss. Nevada Beach has both a campground and day-use beach and picnic area and is a National Forest area operated by a private concessionaire. Nevada Beach is located off of U.S. 50, on the east shore of Lake Tahoe, a short distance north of Stateline, Nevada, near Elks Point Road. Round Hill Pines Beach and Marina is a private resort operated under a permit from the U.S. Forest Service. There is a half mile beach, water sports rentals, and many more amenities for a family day at Lake Tahoe. Check the website for daily parking fees. Round Hill Pines Beach and Marina is located off U.S. 50 a couple of miles north of Stateline, Nevada, and Nevada Beach. Look for the Forest Service sign at the intersection. Kings Beach State Recreation Area has over 700 feet of sandy beach on the north shore of Lake Tahoe. This popular California state park is day-use only and located right in the town of Kings Beach. From Reno, take the Mt. Rose Highway to Incline Village and the intersection with Nevada 28. Go right and cross the state line at Crystal Bay, continuing a short distance into California. Kings Beach State Recreation Area is on the Lake Tahoe side of the highway. Visiting the beach is free, but there is a fee to park. There are food concessions, and rentals for watercraft and other water play toys. Commons Beach Park is located on Lake Tahoe in the northwest shore town of Tahoe City. This is a public park with a swimming beach, picnic areas, and a large playground for the kids. There is no entrance fee. Tahoe City is located near the intersection of Highways 89 and 28, a few miles west of the Nevada state line at Crystal Bay. Both of these beaches are located at the Tallac Historic Site on the south end of Lake Tahoe. Baldwin Beach and Pope Beach are named after two of the estates preserved at the site, both of which once belonged to wealthy families from San Francisco. You can visit the beaches and tour the estate grounds on your own for free. Guided tours of the mansions are available during the summer months for a fee. There is a limited amount of free parking. To add interest to your visit, you can take the short hike to the nearby Taylor Creek Visitor Center, which also has parking. The Tallac Historic Site is approximately 3 miles north of South Lake Tahoe on Highway 89. There is a prominent sign at the entrance. Fallen Leaf Lake is right next to Lake Tahoe. Directions are the same as to the Tallac Historic Site, except you turn left (away from Lake Tahoe) at the intersection with Highway 89 and follow the signs to the Fallen Leaf Lake Campground. Once there, follow the signs to a small day-use parking area and take the trail to the lake. The beach is gravel rather than sand, but lots of people make themselves comfortable. The shoreline is shallow and good for kids. It's also a bit less hectic than some of the crowded beaches at Lake Tahoe itself. Meeks Bay Resort and Marina offers day-use on a sandy beach, along with concessions and a variety of boat rentals. A campground and lodging are available. Meeks Bay is a private resort on Forest Service land and located 10 miles south of Tahoe City off of Highway 89. There is a day-use beach and picnic area across Highway 89 from the William Kent Campground (a Forest Service facility). It's a sandy beach with swimming, picnicking, and non-motorized boating. William Kent Campground is located on the west shore of Lake Tahoe on Highway 89, 2 miles south of Tahoe City. There are three California State Parks located close to each other on Lake Tahoe's west shore near Emerald Bay. Each has access to the shoreline, but the ease of reaching the water and day-use facilities vary at each park. For example, Ed Z'berg Sugar Pine Point State Park has over a mile of beach and shady lawns for picnicking and relaxing. Emerald Bay is primarily for sightseeing and visiting Vikingholm. Get specific details about each park by visiting its website.